This colourful dish is made with sweet, juicy mussels, succulent tiger prawn tails and saffron-flavoured rice. Place the mussels in a colander and rinse under cold running water, pulling off any beards or barnacles from the shells, and removing any dirt. Discard any mussels that do not close when tapped firmly. In a large frying pan or wok, heat the oil then fry the onion for 4-5 minutes until starting to soften. Add the garlic and peppers, and cook for a further 2-3 minutes. Add the rice and paprika, and cook for 1-2 minutes, stirring, to coat the grains. Add the wine and cook for 1-2 minutes to reduce slightly, then add the saffron and stock. Mix well then simmer for about 10 minutes, stirring occasionally. Add the prawns, peas, cleaned mussels and seasoning, with a little more stock or water, if needed. Cover (use foil if you don’t have a lid) and cook over a medium heat for another 10 minutes. Check that the seafood is cooked – the mussel shells should have opened (discard any that remain tightly closed) and the prawns should have turned pink. Serve with crusty bread and lemon wedges. For more information on preparing mussels, visit waitrose.com/howto. Try other seafood such as squid rings. Just add for the last 5 minutes of cooking. 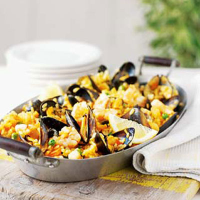 Try a full-bodied fruity, white Spanish wine that is ideal for serving with paella.